Sun Valley East is a 55+ community located in Boynton Beach, Florida. Residents of this community enjoy a low-maintenance lifestyle with numerous opportunities to be socially and physically active. The community is conveniently located close to numerous options for shopping, dining, and medical services. Residents inside Sun Valley East enjoy a nice clubhouse with amenities aimed at keeping them socially charged and physically active. Those who would like to stay in shape can utilize the fitness room with cardiovascular and weight-training equipment. Residents looking for a more social lifestyle will enjoy gathering with neighbors and friends in the card room for a game of bridge or in the hobby and game room for some billiards or table tennis. There is also a library with hundreds of great titles to choose from. The amenities continue outside with a resort-style pool, as well as tennis, pickleball, and shuffleboard courts. There's also a dedicated area for dogs. Built between 1990 and 1996, Sun Valley East consists of 354 attached homes available on a resale basis. Here, homebuyers can select from available townhomes and attached quads both offering convenient low-maintenance living. Townhomes in the community range from 1,353 to 1,628 square feet of living space with two bedrooms, two bathrooms. These single-level units offer the ultimate in low-maintenance living. The attached quads offered in the community range in size from 1,417 to 1,800 square feet of space. These homes have at least two bedrooms, two bathrooms, and an attached garage. All quads cater to the active adult lifestyle with open floor plans, step-less entries, and convenient low-maintenance exteriors. Residents living in Sun Valley East enjoy a great low-maintenance lifestyle. An annual homeowners' association fee covers general maintenance and upkeep of the clubhouse and community grounds. The fee also covers lawn care and trash removal of all homes in the community. This lifestyle allows residents more time to relax with family and friends and enjoy old hobbies while exploring new ones. 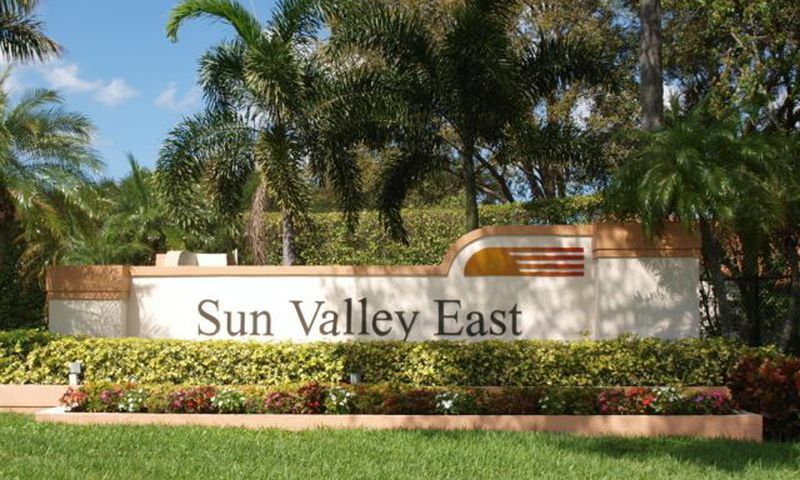 Located in Boynton Beach, Florida, Sun Valley East is situated just a few miles west of the Atlantic Ocean. Residents of the community enjoy the convenience of being close to a myriad of choices for shopping, dining, and entertainment. With close proximity to I-95 and the Florida Turnpike, residents looking to travel to other parts of Florida can do so easily. Those looking for a great active adult community in the Palm Beach County area should check out everything going on in Sun Valley East. There are plenty of activities available in Sun Valley East. Here is a sample of some of the clubs, activities and classes offered here. Townhomes in the community range from 1,353 to 1,628 square feet of living space with two bedrooms and two bathrooms. These single-level units offer the ultimate in low-maintenance living. Please Note: Floor plans are not available at this time. The attached quads offered in the community range in size from 1,417 to 1,800 square feet of space. These homes have at least two bedrooms, two bathrooms, and an attached two-car garage. All quads cater to the active adult lifestyle with open floor plans, step-less entries, and convenient low-maintenance exteriors. Please Note: Floor plans are not available at this time. 55places.com is not affiliated with the developer(s) or homeowners association of Sun Valley East. The information you submit is distributed to a 55places.com Partner Agent, who is a licensed real estate agent. The information regarding Sun Valley East has not been verified or approved by the developer or homeowners association. Please verify all information prior to purchasing. 55places.com is not responsible for any errors regarding the information displayed on this website.